So far I’ve tried quite a few beauty products from Madara and almost everything that I’ve tried I loved. Madara focuses on creating natural beauty products of the highest quality with organic ingredients extracted from Baltic plants. Their products are certified by EcoCert which means that each product has to meet a minimum threshold of natural and organic ingredients. If you’ve been following my blog for a while, you know that I am a big fan of natural soap bars so when I was contacted by Showcase Beauty offering me to test two Madara soaps, I couldn’t decline. I already love the brand but their soap bars were new to me so I decided to go ahead and agreed to test and review Madara Charcoal Detox Soap and Madara Volcano Scrub Soap. First of all, before I go into details about Madara soap bars, let me briefly tell you all about the Madara brand, their philosophy and the ingredients they use. Madara’s products are cruelty-free and made in Latvia as this is where the company was launched. It’s been 10 years since the company’s launch and the brand is going strong. The brand has now won several awards and is loved and praised often in the green beauty community. No wonder, since their products are pure and as natural as they could be and also, they are actually really effective. Their philosophy is that skin care “goes deeper than skin”. They believe in a holistic approach, so their products are not created just to make you look better, but also to make you feel and act better. For this reason, they pay great attention to things like packaging and the environmental footprint. They are also proud to say that they only make honest claims about their products which contain scientifically validated ingredients. The organic ingredients used by Madara come from pure and precious essences of northern herbs, arctic berries and unique seed oils. They are full of antioxidants and rich in omega-3 fatty acids which gives them potent anti-ageing properties. Some of the Madara’s products that I’ve tried so far and loved are Madara SPF30 Age-Defying Sunscreen, Madara Daily Defence Ultra Rich Balm and Madara Brightening AHA Peel Mask. Having tried loads of natural soap bars previously, I know exactly what makes a good bar of soap. 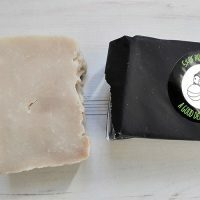 Not all natural soap bars are created equal and some are better than others! I really like that Madara Charcoal Detox Soap is palm oil free and also vegan. It’s 100% natural and contains no sulphates, mineral oils, synthetic fragrance and artificial colouring agents. I’ve never tried charcoal soap before so I wasn’t sure what to expect. The amazing purifying power of charcoal draws out toxins and impurities to deeply, yet gently, cleanse your skin. Mysterious notes of orris and pine feel like a revitalising swim in an unspoilt forest lake. Charcoal is known for its detoxing properties and is used in medical emergencies to treat overdoses and cases of poisoning. It works very well for these emergencies due to its toxin-absorbing properties. It’s also great for removing toxins from water and may even help with your oral health. However, there is more scientific research needed in order to prove some of its health and beauty claims. In regards to skincare, activated charcoal can help draw microparticles, such as dirt, dust, chemicals, toxins, and bacteria, to the surface of the skin, to make removing them easier. I was really curious to see what charcoal soap can do for my skin. It sounded perfect for my combination skin prone to breakouts. 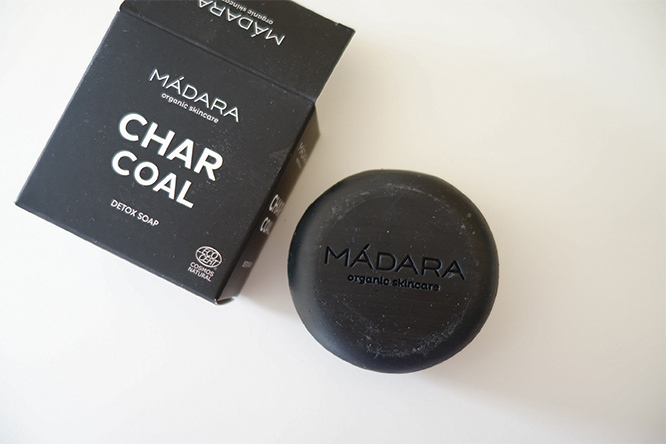 The Madara charcoal soap is black (obviously!) and when you start using it, your hands will go all black and the black colour will be highly visible in your bath or shower. I don’t have a problem with that as this can easily be washed off. However, you should make sure you put the soap onto a soap dish after use to avoid staining your bath or shower. The soap foams really well and it doesn’t go soft with use which is something that happens with some of the natural soap bars. I really like that. Madara Charcoal Detox soap is really firm and it doesn’t melt at all. It’s a long lasting soap as well. When using it for showering almost every day, after a couple of weeks, I had plenty of soap left. Some natural soap bars don’t last very long so this is another positive of this soap – it will last you for a while. What I also loved about this soap was that it doesn’t dry out the skin, not at all, at least on my body. Instead, it leaves my skin soft and nourished. When Madara’s charcoal soap was used on my face, I could feel this rich and moisturising lather softening my skin and removing all the impurities leaving my skin really clean, ready for the next step in my routine. If you have dry skin on your face, it’s probably better not to use this soap as it may dry it out further. That’s because this soap will remove the natural skin oils that are protecting your skin. I think if you are going to use this soap for the face, it’s better suited for oily/combination skin which is prone to breakouts and blackheads. Although my skin is prone to breakouts, lately I haven’t been having many or almost none so I cannot say for sure how well Madara charcoal soap works for those. But just to mention, once I did use the Madara charcoal soap when I had a big under-the-skin spot coming out and after massaging the soap well into this spot, it actually felt reduced in its size once I was out of the shower. I will continue testing this soap on my face to see if it always works on breakouts that are appearing or those that are already there. Sodium Cocoate**, Aqua/Water, Glycerin**, Coconut Acid, Charcoal Powder, Aroma/Fragrance, Simmondsia Chinesis (Jojoba) Seed Oil*, Sodium Citrate, Sodium Chloride, Betaine, Linalool*** – *Ingredients from Organic Farming / **Made using organic ingredients / ***Natural essential oils. The scent of Madara’s Charcoal Detox soap is not bad. I would say it’s a bit earthy and I think charcoal definitely contributes towards that. But it’s not unpleasant at all as Madara also adds some natural fragrance to it. Overall, Madara Charcoal Detox soap is really good, I am really impressed with it. It’s a pleasure to use, with a pleasant smell, it’s long lasting and if you buy it you will certainly not regret it. Madara Volcano Scrub Soap is also 100% natural, vegan and sulphate-free. It doesn’t contain microplastic which is something that some exfoliators contain. I haven’t tried anything like that previously so this Madara soap also impressed me. How well does Madara Volcano Scrub soap exfoliate the skin? To exfoliate the skin, Madara Volcano Scrub Soap contains black lava sand which is gentle but very effective in removing dead skin cells. I haven’t seen this ingredient in any other scrubs before. I’ve tried some natural soap bars before which had poppy seeds and oats in them to exfoliate the skin but these ingredients don’t work so well for exfoliation from my experience. Black lava sand, on the other hand, is fantastic. It actually stays on the bath sponge and really helps to exfoliate the skin. The soap bar contains a good concentration of black lava sand which makes it very effective – in this way the soap acts like a gentle body scrub that you can use every day. It doesn’t dry out the skin and it’s extremely gentle. It reveals lovely, soft skin every time you wash with it and I didn’t feel it made my skin dry. It actually feels quite nourishing on the skin. The scent of Madara Volcano Scrub Soap is pleasant and comes from uplifting notes of cedar and lime. It’s not a very strong scent but it’s strong enough to make your shower more enjoyable. I really loved this Madara soap, it’s one of the best natural soap bars that I’ve ever tried. It’s also a long lasting soap bar although I think Madara’s Charcoal Soap lasts a little bit longer. Have you tried any of the Madara’s soap bars yet and what did you think?